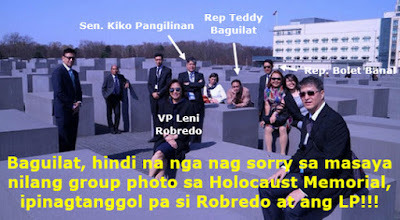 Ifugao Rep. Teddy Baguilat breaks his silence over the controversial happy group photo of some Liberal Party (LP) members at the Holocaust Memorial, a memorial in Berlin dedicated to the Jewish victims of the Holocaust, a genocide during World War II that killed around 6 million Jews. This is after they were heavily criticized on social media. “We posed at the Holocaust Memorial not to demean the place. But I took down the tweet immediately so as not to hurt sensibilities. Our German trip was paid for by a German Foundation and in the study trip, we discussed shared democratic values.” Baguilat, LP’s vice president for internal affairs tweeted on Sunday, April 15. As anyone would understand his tweet, Baguilat did not apologize or is not sorry despite the fact that their group photo is obviously disrespectful. In fact, he appears to be also defending LP. No wonder, many netizens who replied to his tweet urged him to apologize to the German people, and to the Filipinos for their shameful act. Aside from him, also in included in the Holocaust Memorial group photo are VP Robredo along LP President, Senator Francis “Kiko” Pangilinan, QC Representatives Bolet Banal and Kit Belmonte, former Budget Secretary Butch Abad, Marikina City Rep. Miro Quimbo, Dinagat Islands Rep. Kaka Bag-ao, and three other LP members. As of posting, VP Robredo, Sen. Pangilinan and other LP members who were include in the group photo have not yet commented on his issue. Nevertheless, even their supporters disagree with it. In her open letter to LP on Monday, April 16, Pinoy Ako Blog (PAB) blogger Jover Laurio said that the photo is so wrong in so many ways. “First, yung mga taga Germany pag pumupunta dito hindi ngumingiti kasi masakit sa kanila ang alaala ng kasaysayan. Alam ko puwede naman silang upuan. Pero ang mali siguro yung expression sa mga mukha niyo. Dapat po sana naging sensitive kayo sa history ng lugar. An honest mistake is still a mistake.” The pro-LP blogger wrote.